Philately: The first stamps of France were issued on 1 January 1849. In last years issue France over 200 (!) stamps every year. Sometimes imperforated French are offered by some dealers, especially in Internet. These stamps are printed in very small quantities and offered to the authorities (Postmaster General, Minister's office, prefects, designer of stamp, etc.). And sometimes these authorities sell them to traders who, themselves, sell them to collectors. These imperforated "stamps" are not valid for postage and can not be used for franking letters. 20.6.1992"Tautavel Man" 17.06.2000 "Natural History Museum"  21.08.2008 "Prehistoric animals"
01.06.2010 "Institute of Human Paleontology"  04.01.2014 "Dynamic"  05.01.2018 "Works of Nature"
 Georges Buffon (1709-1788) depicted on stamp with face value of 12+4F He envisioned the nature of science and understood the roles of paleontology, zoological geography, and animal psychology. He realized both the necessity of transformism and its difficulties. Although his cosmogony was inadequate and his theory of animal reproduction was weak, and although he did not understand the problem of classification, he did establish the intellectual framework within which most naturalists up to Darwin worked.Buffon is considered the founder of evolutionary theory. George Buffon set forth his general views on species classification in the first volume of his "Histoire Naturelle".Buffon objected to the so-called "artificial" classifications of Andrea Cesalpino and Carolus linnaeus, stating that in nature the chain of life has small gradations from one type to another and that the discontinuous categories are all artificially constructed by mankind. Bernard Palissy (1510–1589) depicted on stamp with face value of 12+3F.who was a French Huguenot potter, hydraulics engineer and craftsman, famous for having struggled for sixteen years to imitate Chinese porcelain. In the 19th-century, Palissy's pottery became the inspiration for Mintons Ltd's Victorian majolica, which was exhibited at the Great Exhibition of 1851 under the name "Palissy ware".Palissy is known for his contributions to the natural sciences, and is famous for discovering principles of geology, hydrology and fossil formation.He was one of the first Europeans to enunciate the correct theory of the origin of fossils Palissy correctly maintained that fossils were the remains of once living organisms, and contested the prevailing view that they had been produced by the biblical flood, or by astrological influence. He argued that minerals, dissolving into water to form "congelative water," would precipitate and thereby petrify once living organisms in order to create fossils. Some catalogs listed these 3 stamps as a set, some other as individual stamps. Pink stamp shows Georges Cuvier (1769-1852), was a French naturalist and zoologist, sometimes referred to as the "father of paleontology". Cuvier was a major figure in natural sciences research in the early 19th century, and was instrumental in establishing the fields of comparative anatomy and paleontology through his work in comparing living animals with fossils. He is well known for establishing extinction as a fact, being the most influential proponent of catastrophism in geology in the early 19th century, and opposing the evolutionary theories of Lamarck and Geoffroy Saint-Hilaire. His most famous work is the Le Rgne Animal (1817; English: The Animal Kingdom). In 1800, Cuvier was the first to correctly identify in print, working only from a drawing, a fossil found in Bavaria as a small flying reptile, which he named the Ptero-Dactyle in 1809 (later Latinized as Pterodactylus antiquus)--the first known member of the diverse order of pterosaurs. In 1808 Cuvier identified a fossil found in Maastricht as giant marine lizard, which he named Mosasaurus, the first known mosasaur. Cuvier speculated that there had been a time when reptiles rather than mammals had been the dominant fauna. Henri Edouard Prosper Breuil (1877-1961) , often referred to as Abbe Breuil, was a French archaeologist, anthropologist, ethnologist and geologist. He is noted for his studies of cave art in the Somme and Dordogne valleys as well as in Spain, Portugal, Italy, Ireland, China with Teilhard de Chardin, Ethiopia, Somaliland and especially Southern Africa. Pierre Teilhard de Chadrin (1881-1955) was a French philosopher and Jesuit priest who trained as a paleontologist and geologist and took part in the discovery of both Piltdown Man and Peking Man. Teilhard conceived the idea of the Omega Point and developed Vladimir Vernadsky's concept of Noosphere. Some of his ideas came into conflict with the Magisterium of the Catholic Church, and several of his books were censured. From 1912 to 1914, Teilhard worked in the paleontology laboratory of the Muse National d'Histoire Naturelle, in Paris, studying the mammals of the middle Tertiary period. Later he studied elsewhere in Europe. Natural History Museum in Paris is one of the oldest natural history museums in the world, has very big fossils collection of prehistoric humand and prehistoric animals, include dinosaurs. On them depicted on stamp from 2000. On January 6, 2014 Post Authority of France issued a booklet of 12 self adhesive stamps with permanent validity and costs of the domestic priority letter up to 20 gr. Dynamic lines, swirling movement of life, in nature, in construction, in craft in art . The booklet highlights the mystery of motion, especially that of the spiral. 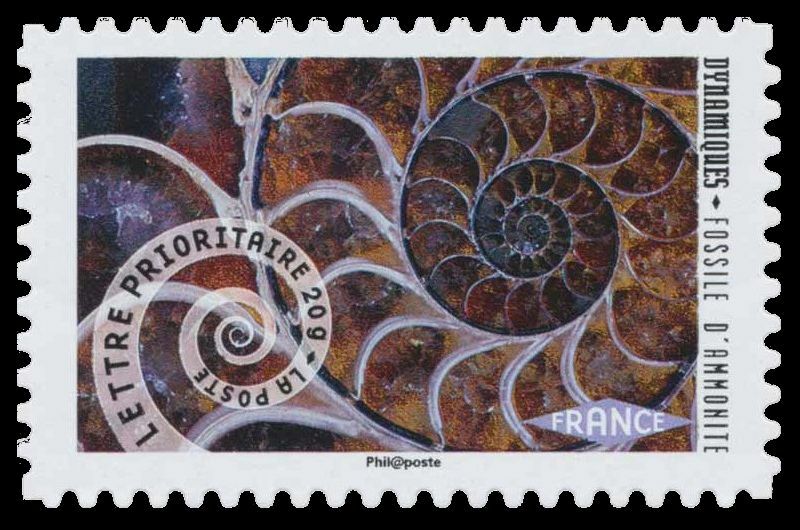 One of these stamp is depicted an ammonite. 09.12.2014 19.05.2016 02.02.2018 "150 anniversary since death of Jacques Boucher de Crèvecœur de Perthes"
14.11.1949 "Famous persons"  15.06.1957 "Famous persons"  13.04.1969 "Cave painting of Lascaux cave"
05.06.1993 "Bicentennial of Natural History Museum"  27.05.2006 "50 years since discovery of cave painting of prehistoric animals of Grotte de Rouffignac"
[A1] During 1977 and 1978 (01.04.1977, 17.01.1978, 01.07.1978) Post of France issued a set Zodiac definitive stamps. Each time 4 stamps are printed. Ammonite depicted on the right buttom corner of the Crab stamp. 10-11.12. 1983 "6th biennial Mineral and Fossils trade show in Bordeaux" 08.09.1984 "3rd biennial Mineral and Fossils trade show in Thionville" 07.11.1984 "7th Mineral and Fossils trade show in Bordeaux"
07.11.1984 "7th Mineral and Fossils trade show in Bordeaux"
03.08.1985 "450.00 years of Tautavel man"
03.08.1985 "Prehistorc museum of Tautavel"
18-19.1986 "X anniversary of philatelic club in Angevin" 25.11.1986 "9th Mineral and Fossils trade show in Poitiers" 09.04.1997 "22nd Minerals and Fossils trade show in St. Nazaire "
12.05.1987 "" 27.07.1987 "Minerals and Fossils trade show in Dijon" 14.08.1987 "Minerals and Fossils trade show in Nantes Rollin"
23.09.1988 "Minerals and Fossils trade show in Blois Gare" 24.08.1988 "Minerals and Fossils trade show in Dijon" 05.10.1988 "200 anniversary of Boucher de Perthes"
14.03.1989 "200 anniversary of Georges Cuvier" 17.04.1989 - 2002 "Thouars history and prehistory" 11.06.1989 "200 anniversary of Georges Cuvier"
12.10.1989 "Minerals and Fossils trade show in Dijon" 06.03.1990 "" 1990-1991 "Reserve geologique de HTE Provence"
02.04.1990 "Minerals and Fossils trade show in Valognes" 28.08.1990 ""
Acknowledge: Many thanks to Dominique Robillard for his help and very valuable feedback.